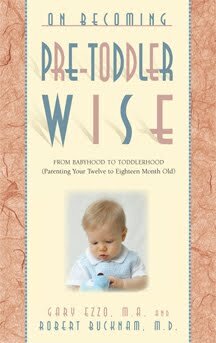 “Do not worry about gaining ground with your pretoddler, (behaviorally speaking), but rather focus on not losing ground” (page 26). “By not losing ground you are actually gaining ground” (pages 26-27). Did you read that right? Yes, I think you did. You just read that you don’t need to make improvements on the behavior of your cute (yet often naughty) 12-18 month old…you simple need to keep your child where she is. You want her to enter life as a 19 month old in the same position she entered 12 month old. Now, of course, if your child will and can make improvements, go for it. But many of the children in this age are difficult behaviorally. I see lots of questions about the little fits they throw. But if not, remember that by not losing ground, you are actually gaining ground. I think of it like a river. You are in a boat (or raft or whatever you want to be in–something you can row). You are headed up stream. You reach this patch where the current is especially strong. If you stop paddling, you are going to move down stream. Sure, you can paddle again in a while to get back to that point, but it will be harder and will wear you out more. If you can at least paddle enough to stay in the same position and wait for the spring runoff to calm down, you can get past that point and move forward more quickly. Ezzo and Bucknam describe it from an investment viewpoint. You have worked to build great habits in your child. You have this investment. Your baby’s sleep, eating, and play habits are your assets. You want to protect these assets. You want to prevent the loss of these assets (found on page 27). What are some of these areas that are an asset? If you have followed the -wise series, you can expect to have a good sleeper. Eating should be predictable and your child should be eating a variety of healthy foods. Your child will have good manners (for a 12 month old). Your child will be able to sign and communicate non-verbally rather than through little fits. Your toddler will already have an awareness of what is off-limits. Your child will be able to play independently by herself. These are the assets you want to protect. Your child might start waking early in the morning. You don’t shrug your shoulders and adjust yourself to an earlier morning waketime. You try to figure out why she is waking and fix it. If she starts protesting independent playtime, you don’t pause for several months. If she refuses to communicate, you don’t give her what she wants anyway. Let me give you some examples from McKenna’s life over the last six months. The most prevalent example in my mind is the morning she wanted more food at breakfast but refused to ask for it in a nice way. She preferred screaming. She was right about 16 months old. She had been signing “more” perfectly for months. That particular morning, she refused. I patiently asked her if she wanted more. She screamed. I told her to say more and showed her. I even tried to take her hands and give her a little help. She refused. I sat at the table pretending to read something while she had her fit. In the end, we left that meal with her not getting more. Had this situation happened with Kaitlyn, I probably would have been a little nervous because I was always so worried about food with her. And even though Brayden was a great eater, I always worried he wasn’t getting enough food. But I have since let that worry leave my mind and have put a lot of trust into my children. They won’t let themselves starve. I have also realized eating a little less at one meal isn’t going to do long-term damage. So we walked away without more. What happened at lunch that day? As soon as she wanted more, she nicely signed it. No fits. No tears. No screams. Just a nice pleasant more sign. I told her good girl and got her some more. We literally have not had a problem since that day. What do you think would have happened if I had given her more at breakfast? Do you think she would have asked nicely at lunch? No. Knowing myself, I would not tolerate it long, but it would be much harder to break that habit of screaming after several meals of allowing it. And that isn’t fair to the child. It is confusing when mom and dad aren’t consistent. Another day I put her in independent play. She cried for about a minute after I left. I could tell it wasn’t a cry of real need. I could have rushed back in to assure her she could play on her own. Instead, I listened until she was done and she has been fine since. No problem. I really could have created some extra work that day, but happily I didn’t. I maintained my spot on the river. I do have to say, however, that this idea of “don’t lose ground” doesn’t mean that you can’t make progress in things. We started independent play with Brayden at 14 months old. So don’t read this and think you can’t make any improvements. While you are rowing, you might gain a few feet :). The point here is to hold your ground. Face that little ball of emotion with confidence. Don’t worry about creating a little toddler who obeys your every word; it isn’t going to happen. But don’t throw your hands up in defeat and decide she will outgrow it someday or she will be “easier” when she is 2 or 3 and you can deal with it then. Maintain what you have. If the current slows, go ahead and see if there is an improvement you would like to make. In the meantime, just think of how strong your arms are going to be! What a great concept, I think it's really applicable in many areas of life. I appreciate your optimism and how you are willing to share ways you learned different skills over time. This seems like a far-off concept, since my baby is only 4 months, but it's always great to have it in mind. Parenting this age group feels EXACTLY like rowing upriver! I think as parents we do need encouragement at this point to not lose ground. Because one day we are going to be past the current and suddenly shoot forward with our strong paddling. 😉 This helps me maintain my resolve to bring my son back to Mother Goose Storytime. He is at a more challenging age for sitting on mats the whole time than the other babies who are closer to seven months old. But I don't want to give up; instead, I can teach him to behave appropriately in that environment by continuing to go and to work on those skills. Thank you!